Cockatiel toys are an important part of a cockatiel's daily life. They provide your cockatiel with things to do so that they can amuse themselves. Mental stiumlation and physical exercise are two big ingredients to a happy cockatiel. 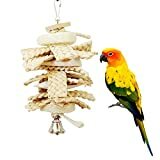 The multi-activity centres are a great toy for your cockatiel. 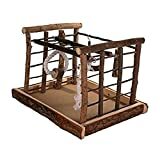 They provide a set of apparatus for your cockatiel to play, jump, swing and explore. They are normally kept outside of the cage as they can sometimes be quite big. These playgrounds provide your cockatiel a great chance to show off their agility and intelligence. TOP PICK! 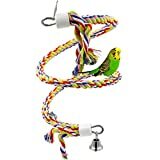 This Cockatiel Basketball Gym, available from Amazon, features hoops, climbers and a perch. If you can teach your cockatiel to shoot a basketball hoop, a treat will appear - amazing! 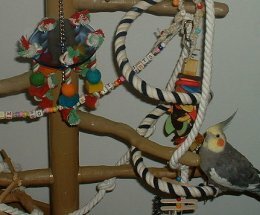 Perhaps one of the most popular cockatiel toys is a ladder. A ladder will give your cockatiel the change to hop from one rung to another to their heart's content. 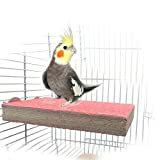 It's a great way for your cockatiel to exercise their legs and toes as they hop up and down their ladder. 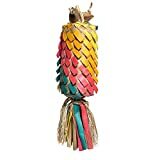 Our favourite cockatiel ladder on Amazon is this one. Cockatiels simply love toys that make noise! 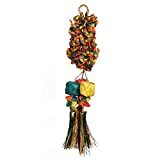 Amongst the most popular are beads and bells. 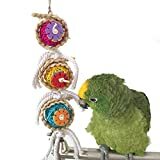 These are toys that will normally hang inside your cockatiel cage. 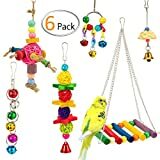 Your cockatiel will love to rattle or jangle these toys and will take great pleasure in listening to the noise that they make. This Wicker Ball with Bell, from Amazon, is likely to be a sure fire hit. The bell toy is small enough to amuse your cockatiel but not so big that you won't be able to hear the television over it!